Robertson’s Texas Brigade emerges from the woodlot south of the Blacksmith Shop and charges the knoll. Battery M, 1st Ohio retreats before it is captured. However, before the Texas Brigade can gain the crest, the 64th and 125th Ohio of Harker’s brigade charge from the north and rout the 4th and 5th Texas. To the south, Sugg’s brigade advances on the Union batteries from the flank, unhinging the entire position. Coleman and Perry charge at the same time, brushing aside the weak infantry supports and overrunning any guns that cannot escape. Fifteen cannons are captured. West of the Poe house, Benning’s Brigade continues north after Robertson. Colonel King, seeing that he is about to be outflanked, orders the 105th Ohio to wheel and charge the Confederates. The charge is a success. Benning’s small brigade taken by surprise on the flank and flees to the south. The 105th Ohio continues in pursuit. For an in-depth analysis of the 105th's charge, click here. Meanwhile, Colonel King pulls back the remainder of the brigade to the northeast, linking up with the other brigade of Reynold’s division under Brigadier General Turchin. 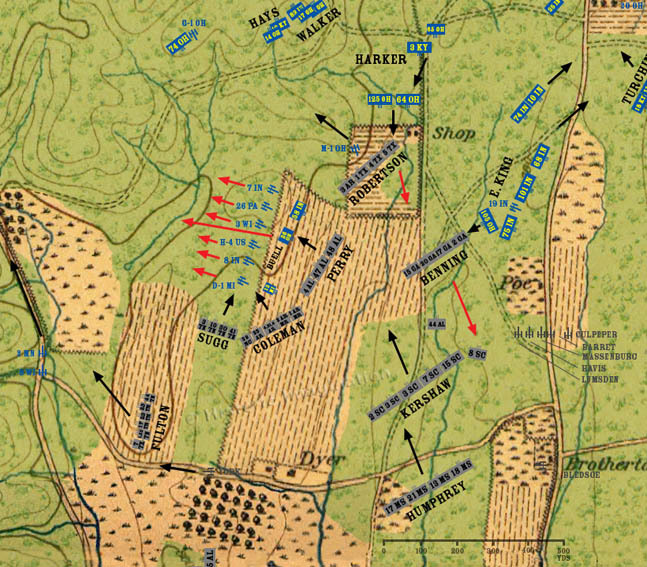 The Confederate Reserve Artillery deploys south of the Poe house and engages the Union infantry retiring toward Snodgrass Hill and Kelly Field.